"I will always remember building fires for the Lobster Cookout with Norm and his "
Norman H. Douglas of Chelmsford, passed away peacefully in his home on January 13, 2018 surrounded by his family. Born in Orrville, OH in 1940, he was the youngest son of Nelson and Alice Douglas. 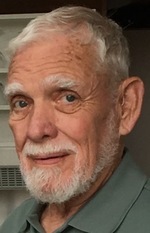 He was the beloved husband of Carol; loving father of Jeanne (Mark) Mahanna of Medway, MA, Jon (Kim) Douglas of Reston, VA, and Steve Douglas of Edwards, CO; cherished grandfather of Ben and Jessica Mahanna and Hannah and Josh Douglas. Brother of Paul (Sioux) Douglas of Juneau, AK, brother-in-law of Linda McCann of Mathews, VA, Uncle of Amy Creighton of CA, Kevin McCann of NY, and Jeff Douglas of AK. Norm lived in Chelmsford for over 50 years and was a devoted member of All Saints’ Church. A graduate of Ohio Northern University, Norm worked for Digital for many years. Upon retirement in 2002, he spent 5 years as a substitute teacher in the Chelmsford public schools. Throughout his retirement Norm gave back to the community in many ways, he volunteered as a Case Reviewer at the Dept. of Children and Families for 15 years and helped at the Table of Plenty in Chelmsford. He was an active member of All Saints’ Church working on the building and grounds there, while also serving as Senior Warden and as a Vestry member. Norm also raised funds to benefit “For His Children”, an orphanage in Ecuador that had special meaning to him. He was an avid craftsman and a self-taught stone mason, dedicating much of his time in this capacity for friends and for his church. He enjoyed hunting, fishing and boating throughout his life instilling the love of the outdoors to his children and grandchildren. A Memorial Funeral Service will be held on Saturday, January 20, 2018 at All Saints’ Episcopal Church , 10 Billerica Road, Chelmsford, MA 01824 at 11:00 AM. In lieu of flowers memorial donations can be made to: All Saints’ Episcopal Church, 10 Billerica Rd. Chelmsford, MA 01824 or to “For His Children” PO Box 912412 Denver, CO 80291-2412. To leave a fond memory of Norm, please find us on Facebook.